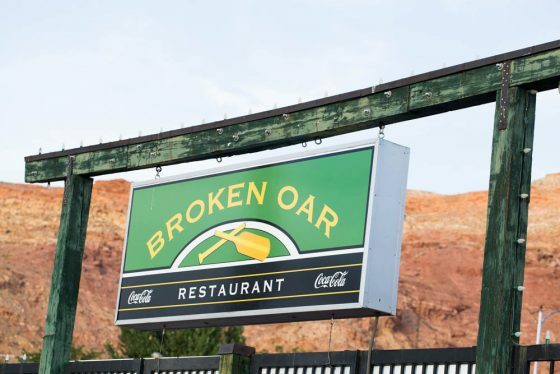 After we were checked into our hotel, we had dinner at The Broken Oar Restaurant. 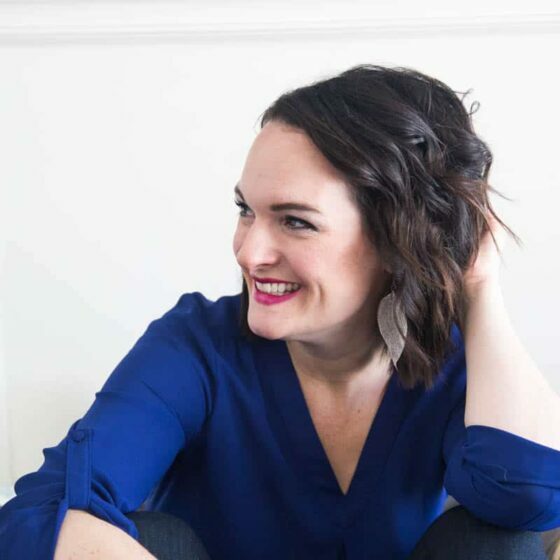 If you’re traveling with small children and looking for a place to have a grown-up meal, but not get the stink eye when your 1-year-old throws food on the floor, The Broken Oar is the place to go. I loved how family-friendly it was! 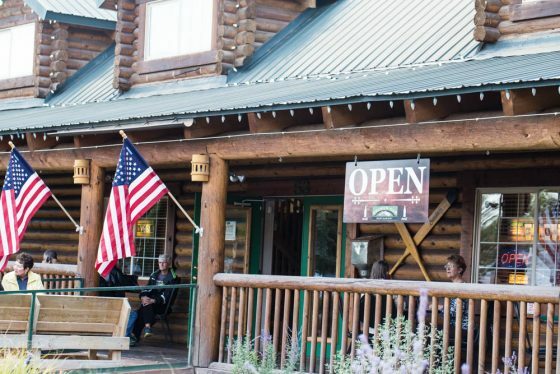 The restaurant has a rustic lodge type of atmosphere — like a place you’d go after a day of skiing or hiking for a big, hearty meal. 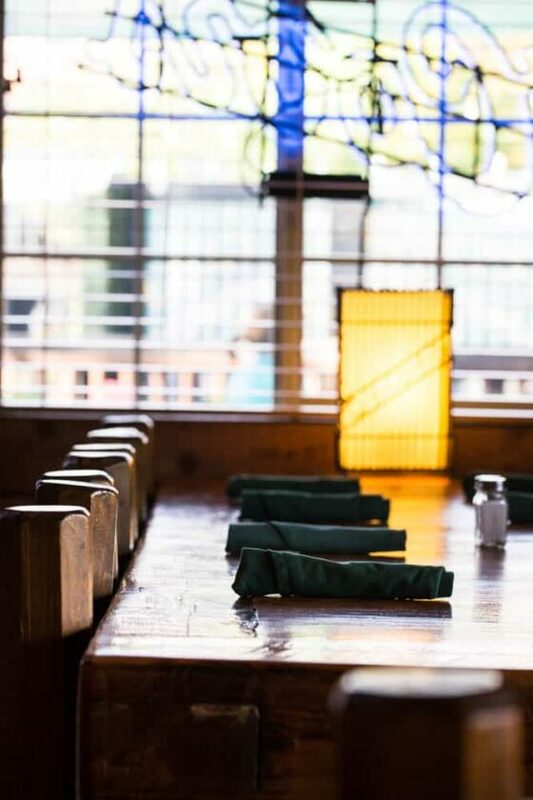 The staff was helpful and friendly and we loved our server, Danielle. We had connected online before we arrived, and she’s just as warm and generous in person as I hoped she’d be. The Broken Oar is owned by Randy Apadaca and used to be a bakery owned by his mother. Randy has been running The Broken Oar for about ten years and his mother made all of the desserts herself (from scratch) until recently when Randy’s sister took over. We had some raspberry white chococlate cheesecake for dessert, and it was outstanding — and definitely made from scratch! I ordered the walleye with mashed potatoes and asparagus, Steve got a rack of ribs with sides and shared a pulled pork sandwich with our 7-year-old. The rest of the kids ordered off the kids menu. I appreciated that there were actual dishes on the kids menu instead of just chicken nuggets and mac ‘n’ cheese. 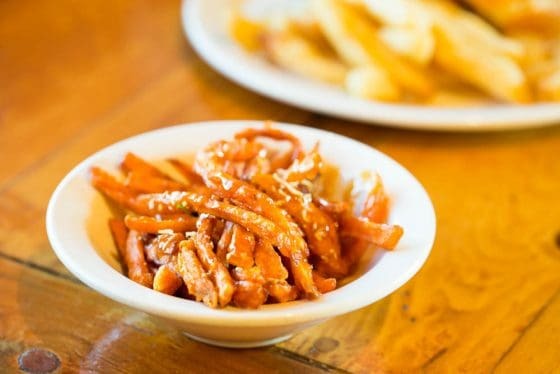 There’s a sign out in front of the restaurant that says “Home of the Sweet Potato Fries,” and I wondered about these fries that earned such a prominent placement. Let me just say that they earned that place on that sign. They’re crispy and light and have some kind of sweet sauce drizzled on them as well as citrus zest — orange or lemon? Right now I’m kicking myself for not asking what that sauce was. I may have to come up with my own version! When we were leaving the restaurant there were probably 20 people outside waiting for tables. On a Tuesday. That tells you how popular this place is! Thank you, Randy and Danielle, and everyone at The Broken Oar for a wonderful time and full, happy bellies! 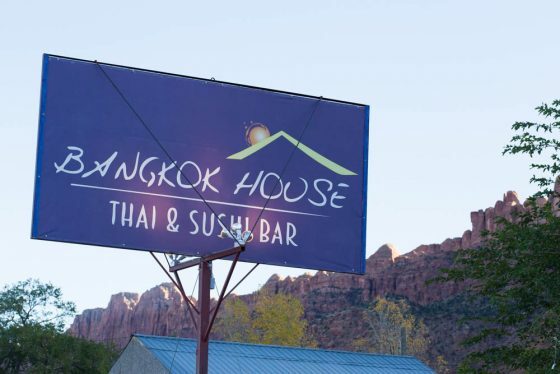 When I realized there was a restaurant in Moab that had BOTH Thai and sushi there wasn’t a question in my mind — we were going. 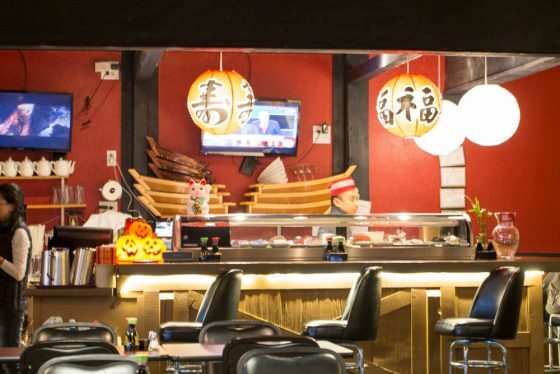 If we didn’t have the kids with us, we would have totally sat at the sushi bar. That’s our favorite spot. 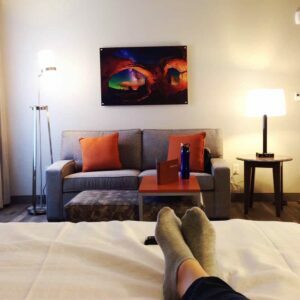 Speaking of having kids with us — we felt totally comfortable with them there. We were kinda loud, but just because the food was really good. We also ordered green curry, massaman curry, and a couple of sushi rolls. We’ve eaten at a LOT of Thai restaurants since we’ve been married and this is definitely one of the best. I love that the curries weren’t too sweet either. And our little 1-year-old? He said “sushi” for the first time and then over and over since we couldn’t feed him those California rolls fast enough. It was a proud moment for me. 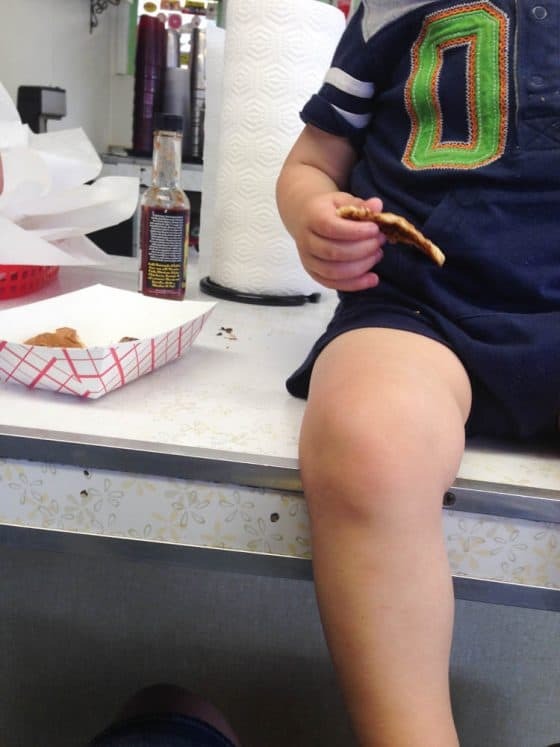 Luckily our kids are kind of cool and like most ethnic food we throw their way. 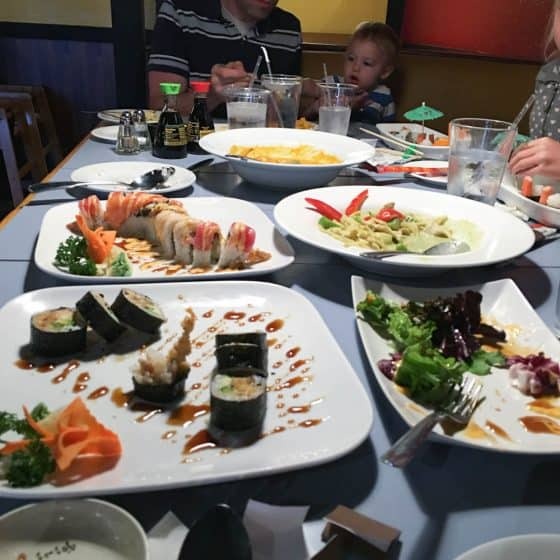 The kids’ sushi meals stole the show. 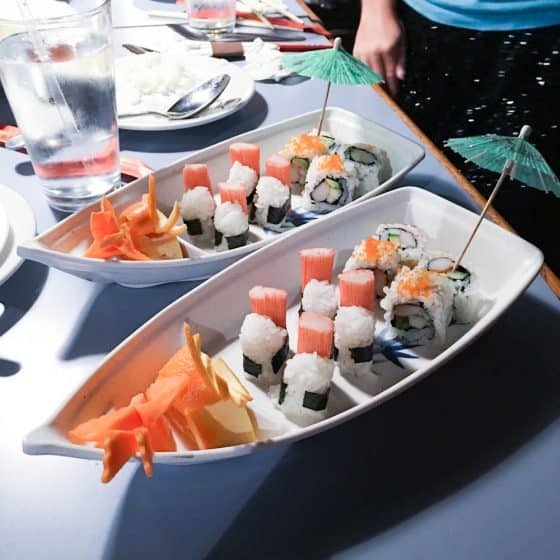 How cute are these boat bowls? Our girls went bonkers over them, as well as the little carrot and orange carvings. They were begging to take the bowls home with them. Sandy let us ring the gong on the way out, too. 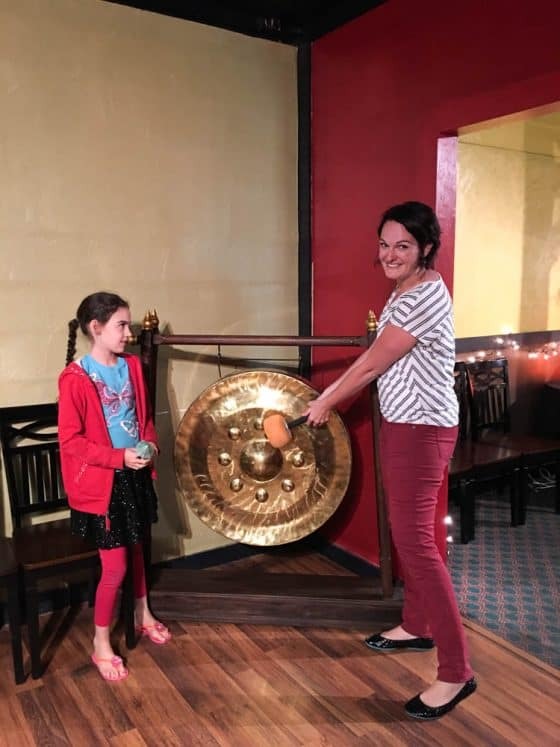 According to Thai culture you ring the gong and make a wish. My 7-year-old made her wish known loud and clear that she wanted to go back the next night. She actually said it again last week when we asked them where they wanted to go out to eat. Next time we’re in Moab, dear. Definitely next time. Thank you, Venus and Sandy, and everyone else at Bangkok House! On the third day we wanted something quick, so we went to Milt’s. Milt’s is the oldest restaurant in Moab and the burgers are pretty amazing. 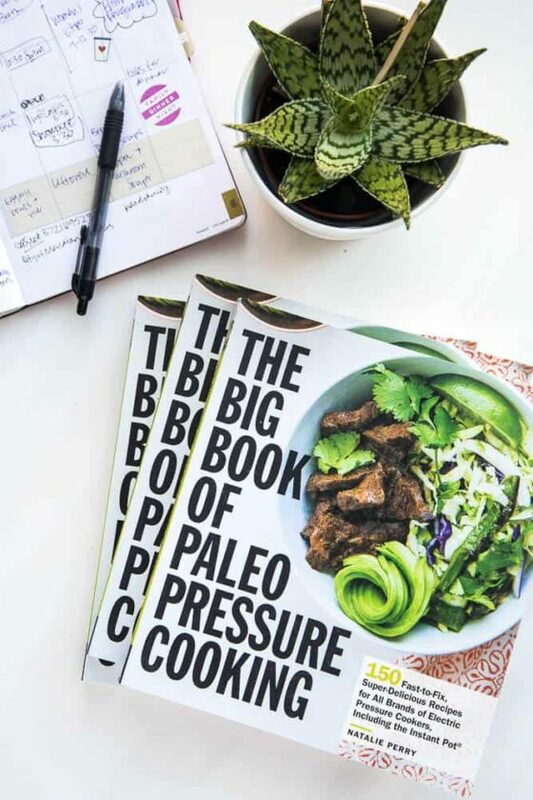 I love that the meat is sourced well, too — they use local, hormone-free, grass-fed beef! 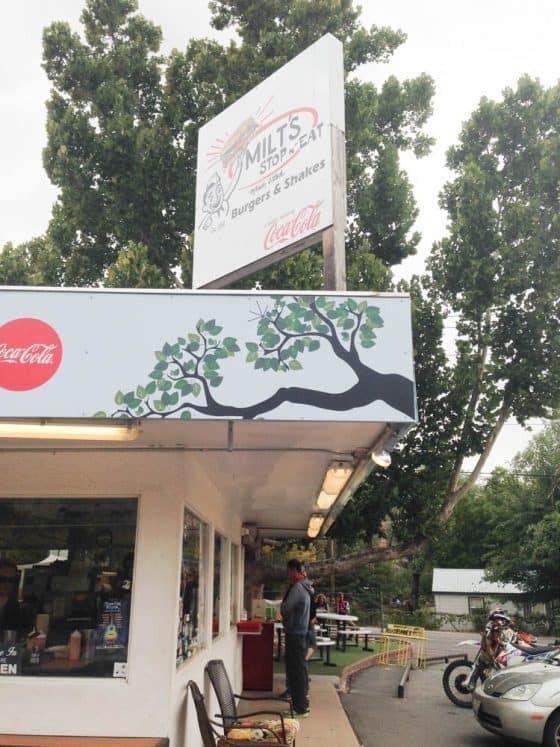 Milt’s opened in 1954 and the vinyl-topped barstools and formica counter tops are original. It makes me wonder how many sets of baby legs rested on those counters. 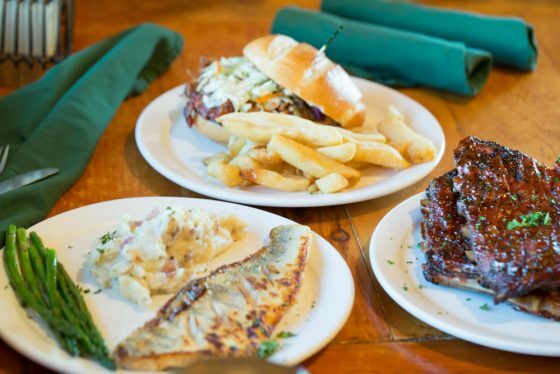 You definitely made an impression on us, Milt’s! 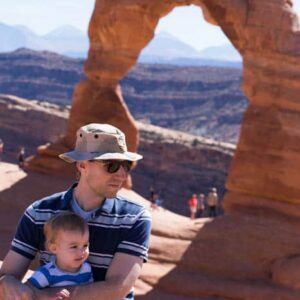 Check out the rest of our Moab Adventures! Disclosure: The Broken Oar and Bangkok House each provided a meal for our family. 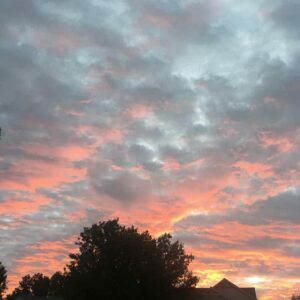 I received no monetary compensation for writing this post, and all opinions shared are my own.